Today is my last day at CFR. I’m joining ReNew Power, India’s largest renewable energy firm, as their CTO. I’m excited for a new adventure but sad to leave the Council, which has given me support and autonomy to study the innovations needed for global decarbonization. Solar energy, wind energy, and battery energy storage are widely regarded as the three most prominent clean energy technology success stories. In 2017, the International Energy Agency listed them as the only technologies being deployed rapidly enough to help limit climate change. Power from solar and wind farms is now routinely sold at prices below that of electricity from fossil-fueled generators, and cheaper batteries are fueling rising sales of electric vehicles as well as a building boom of grid-scale electricity storage projects. Governments around the world might conclude that innovation in solar, wind, and storage is no longer a priority. Such a conclusion would be a mistake. The impressive performance and promising projections for these three technologies obscure an underlying stagnation. In each case, a single dominant technological design has emerged, which private industry is presently scaling up. 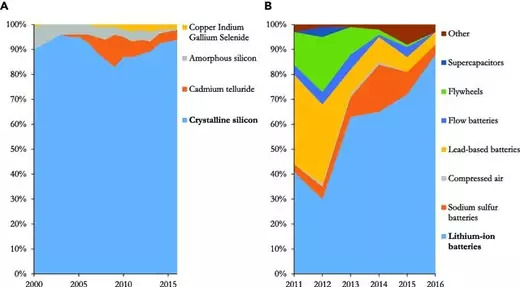 As Figure 1A reveals, crystalline silicon panels have strengthened their near-monopoly in solar photovoltaic energy in recent years. Figure 1B demonstrates that a similar trend is emerging in grid-scale energy storage, as lithium-ion batteries relentlessly increase their market share. And in wind energy, horizontal-axis wind turbines have enjoyed a virtually 100% market share for decades. Figure 1. Global Market Shares of Dominant Designs in Solar Photovoltaic and Nonhydro Grid Energy Storage (A) Percentage of global annual solar photovoltaic panel deployed capacity by technology (Source: Fraunhofer ISE). (B) Percentage of global annual grid-scale energy storage deployed capacity by technology, excluding pumped hydroelectric storage (Source: International Energy Agency, Tracking Clean Energy Progress, 2018). While these ‘‘dominant designs’’ have made clean energy more competitive with fossil fuels in the near term, they pose a significant risk in the long term: ‘‘technological lock-in.’’ Technological lock-in has been documented across a range of industries in the past—especially in legacy sectors with entrenched incumbent firms and regulatory inertia. Once it sets in, new technologies struggle to achieve commercial traction even if they are superior to existing ones. The warning signs of lock-in are clear across all three fields. Private industry is devoting virtually no investment to the development of next-generation technologies, while making massive bets on the rapid deployment and incremental improvement of existing technologies. If new solar, wind, and storage technologies are ‘‘locked out,’’ global efforts to reduce greenhouse gas emissions could fall well short of those needed to avoid the worst consequences of climate change. To be sure, it is impossible to be certain that new technologies will be needed, but a prudent risk management strategy would be to prepare for the likely scenario that they are. 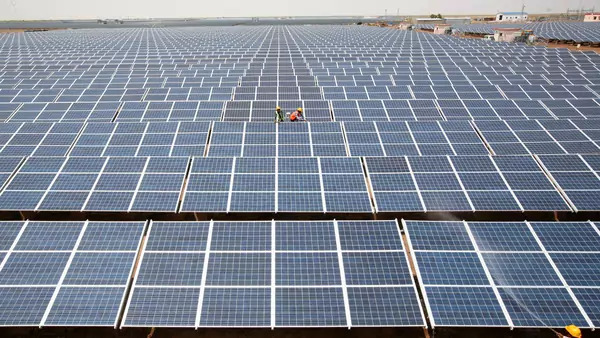 Governments around the world should step in to boost funding for research, development, and demonstration of new solar, wind, and battery technologies that have the potential to outperform the current market leaders. These technologies will not attract substantial private investment without such public support. Well-designed policies would spread public funding across a diverse range of technologies and phase out that support as technologies mature, ensuring maximal return on public investments in innovation. Governments are not the only—or even the primary—entities needed to advance clean energy innovation. The private sector is center stage for the development and commercialization of new technologies, and I’m eager to help my new firm establish itself as a technology leader. Still, I’ve learned through my time at the Council that supportive public policy can unleash private innovation. At the Council, I am grateful to all of my colleagues who have made my time here enjoyable and stimulating. I’m especially thankful to Richard Haass and Jim Lindsay for their support of my work. I’m also indebted to Michael Levi for taking me under his wing (and trusting me with his blog!). None of my work would have been possible without my two superb research associates, Sagatom Saha and Madison Freeman, and our dynamic interns. Finally, I’ve been fortunate to work with world-class collaborators, who have opened my mind to new ways of thinking. I’ll miss the vibrant DC policy ecosystem and would love to host visitors over a cup of chai in New Delhi!